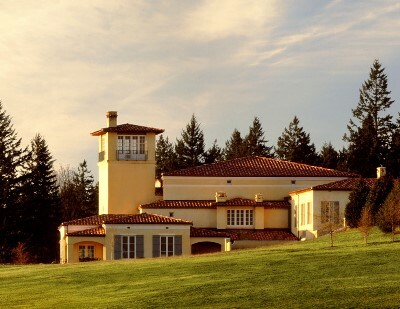 Domaine Serene, named for the daughter of owners Ken and Grace Evenstad, sprang to life when the Evenstads purchased 42 recently logged acres atop the Dundee Hills in Yamhill County, Willamette Valley. The couple produced their first Pinot Noir the next year, and the accolades were immediate. The enterprise has traced an upward trajectory ever since. From the start, Domaine Serene has fashioned its Pinot Noir on the Burgundian model of elegant, medium-bodied wine with a deep core of concentrated flavors. (The couple recently purchased Château de la Crée in Burgundy’s heartland, the Côte d’Or, including vineyards in several famous appellations.) The four Serene wines I just tasted, from the Willamette Valley, reflected Domaine Serene’s broad mix of single-vineyard and blended Pinot Noirs. It was a rewarding exploration. Domaine Serene Pinot Noir Yamhill Cuvée 2011 ($45). The term cuvée on a Serene label indicates that the wine is blended from grapes of multiple vineyards. The 2011 Yamhill makes its first impression with a distinctly violet hue and a Burgundian bouquet of black cherry that’s borne out on the palate as well. Flavors that initially seemed rather laid-back gathered generosity as the wine evolved in the glass over a period of nearly two hours. 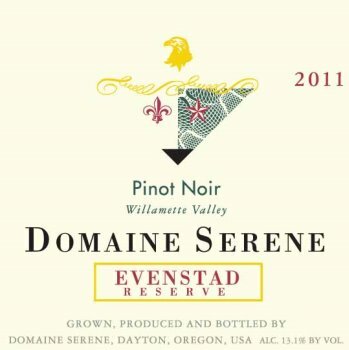 Domaine Serene Pinot Noir Evenstad Reserve 2011 ($65). This is Serene’s reference Pinot Noir – or “flagship,” to use its own term – and its complexity bears out that pride of place. Though its label doesn’t display the word cuvée, the Evenstad Reserve is blended, and the finesse of that blending tells in a layering of flavors from red fruit and vanilla to loam and spices. Ripe tannins and a precise acid structure augur well for the Evenstad Reserve’s aging potential. 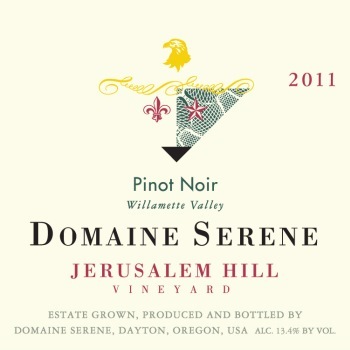 Domaine Serene Pinot Noir Jerusalem Hill 2011 ($90). This handsomely crafted single-vineyard wine proved to be my favorite of the four Pinot Noirs in view. Given its medium weight, harmonious balance between cherry-strawberry flavors and poised acidity, I might have taken it for a Burgundy. While the Jerusalem Hill showed good grip in its tannins, it also presented seductive smoothness. Here was a luxurious expression of Pinot Noir. Domaine Serene Pinot Noir Two Barns 2011 ($85). Another single-vineyard wine, the Two Barns struck me as an anomaly in the Serene lineup: an unmistakably American take on Pinot Noir. Quite dark in color, it also boasted an imposing, forward flavor blend — even if rather than opulence, one encountered notes of dried strawberries, dried leaves and rich earth. This decidedly masculine profile only grew in its appeal as the Two Barns aerated in the glass. The wine’s excellent acid frame and ample tannins suggested the longest aging potential among these four Pinot Noirs.